Middlebury College's Mahaney Center for the Arts acquired a new Steinway concert grand piano last December, and just last month Saint Michael's College had its older one in the McCarthy Arts Center rebuilt. Given how rare sizable halls with good concert pianos are in Vermont, this is good news for classical audiences — and even better for pianists. After all, that class of musicians is one of the few that cannot perform on their own instruments. "That's one of the hard things that comes with being a pianist: Everywhere you go, you have to adjust to an instrument," says Middlebury pianist Diana Fanning. Which raises the question: Where do Vermont pianists most enjoy performing? The best pianos, say the smattering of folks interviewed for this article, are currently at Middlebury, St. Michael's, the University of Vermont Recital Hall, the Chandler Center for the Arts in Randolph and the Barre Opera House. Each of these venues has a Steinway D — at nine feet, it's the company's largest, and what is meant by "concert grand." Of the smaller pianos housed at churches — those rent-free spaces where many local pianists perform — musicians number among their favorites those at the Cathedral of St. Paul in Burlington and the South Congregational Church in St. Johnsbury. The latter's seven-foot Steinway B is used in Judith Rankin and Leslie Gensburg's notable Northeast Kingdom Classical Series. What makes these pianos a pleasure to play depends on several factors. Newer is better in the piano world; as Montpelier pianist Michael Arnowitt quips, "Pianos are different from violins, which can be played for 300 or 400 years. Pianos are more like cars: They go downhill in a slow progression — though sometimes you can do a kind of transplant." That transplant, or a complete rebuilding, means restringing the piano and replacing its action, the mechanical assembly that allows the hammers to work. Yet the quality of a piano is often inseparable from the hall in which it sits, say several musicians. UVM's 2003 Steinway is relatively new, but the Recital Hall's acoustics are "wanting," in Arnowitt's opinion. Shelburne pianist Paul Orgel, who helped choose the piano, specifies in an email that "While the hall's reverberance flatters some instruments, it creates a lack of clarity in the piano's sound," often "muddying" it. Allan Day, the Williston-based piano tuner who replaced the St. Mike's piano's action last month (he restrung it 12 years ago), adds that the instrument comes from a period when the company was producing lower-quality pianos. Having rebuilt numerous pianos, and currently at work on the near-dead one owned by UVM's Alumni Hall, Day judges the new sound of the St. Michael's piano "wonderful." Sharon-based pianist Annemieke Spoelstra, who teaches piano at St. Mike's, commends the rebuilt Steinway. 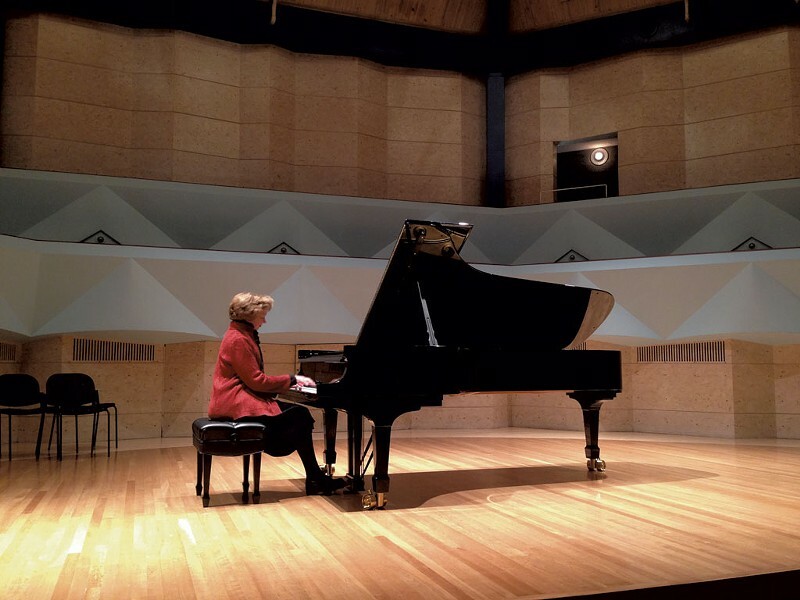 "The difference [from before] was in the weight of the keys," she noted following her faculty concert, which occurred a week after the rebuilding. "The top part, you had to work really hard to make it shine. Now you can use a softer, finer brush" — an aspect Spoelstra appreciated while performing pianissimo-rich Debussy and Grieg compositions. Fanning, who has taught at Middlebury for 37 years, led the selection of the college's new Steinway at the Queens, N.Y., factory with a team that included pianists Richard Goode, co-artistic director of the Marlboro Music Festival; and Paul Lewis, a star on the international solo circuit. The factory preselected five grands, identical on paper but slightly different in sound and action. Variations arise because each is crafted by human hands and from different trees, whose "molecules [could be] slightly further apart," Fanning only half-jokingly comments. Fanning made the same trip to the Queens factory 22 years ago to help choose Middlebury's former concert grand, now housed in Mead Chapel. She confesses she is enamored of both instruments. "The two have really different personalities," she says, standing beside the new piano, which has just been rolled out from its onstage storage space. "This one is extremely colorful, with a very wide range of sound, and there's a freshness to it. You can do anything on it; it has a very responsive action. It's very close to the ideal. "With the other," Fanning continues, "I always found that you could get many, many gradations of pianissimo. We had it well maintained." That instrument was also completely rebuilt less than two years ago. Fanning sits down at the new piano, its gold-plated double wheels nearly out-glinting its high-gloss finish, and plays Chopin's Prelude in A flat major. A truly magical sound fills the empty hall, seeming to resonate equally from different seats around the circular space, no matter how far from the piano. Arguably, the Steinway D at the Flynn Center for the Performing Arts in Burlington, jointly purchased with the Vermont Symphony Orchestra in 2007, is equally fine. But, like many of Vermont's best pianos, it is chiefly used by outside acts that can bring in large audiences, comments Arnowitt. When Vermont pianists perform at the Flynn, he says, they tend to play the Yamaha baby grand in the downstairs FlynnSpace. Nathaniel Lew, a music professor at St. Mike's, suggests that local pianists looking to perform outside churches avail themselves of the college's piano. Because the college has no regular series, such as the Mahaney's in Middlebury or the Lane Series in Burlington, the piano is easy to schedule, he says. A more glaring obstacle than the inaccessibility of existing instruments is the simple dearth of dedicated concert venues. "Really, there aren't that many places to play," Fanning comments, mentally scanning the state. "My own city of Montpelier does not have a good piano," Arnowitt laments. "Vermont College doesn't even have a seven-foot piano." The state's largest city, Burlington, may have the pianos, but it lacks the right-size venues for classical musicians, comments Natalie Neuert. The Lane Series director notes that UVM's Recital Hall seats 300 and the Flynn 1400. "It's incredible to me. We have the wrong-size halls for the size of our community." A midsize hall "would make a huge difference," she adds. That would require buckets of what the whole arts world struggles to lay its hands on: money.